Dear friends, together with a University of Toronto (Mississauga) sociology class studying “Genocide and Memory”, I have spent today (Sunday) at the Auschwitz – Birkenau concentration camps in Oświęcim, Poland. There is much to process and even more to grieve. I’ve been reading Jeremiah lately as part of our “Hope Before Breakfast” focus at Wine Before Breakfast, and I was struck by the metaphor of dancing that arose in our passage for this week. Jeremiah 31.1-14 is a bold proclamation of building and planting for a community that had been torn down and uprooted. And I suspect that it would have been as impossible for those ancient exiles to imagine such hope as it would have been for those at Auschwitz. And all of that got me thinking about dancing and music at Auschwitz, which, of course, brings to mind the great Leonard Cohen. 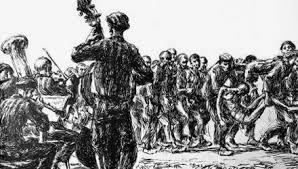 They had an orchestra at Auschwitz. must have the final word. But it is a burning violin. A burning anticipation of the ovens? Or might this be a burning of love? dance me till I’m gathered safely in. until we are gathered safely in. when home has been destroyed. Dancing to the end of love. Is this dance the end of love? Is that what Florence and the Machine meant? Are love and survival impossible to hold together in Auschwitz? Is this what Cohen was getting at? Beyond extermination to the birth of children. Beyond violent separation to tender kisses. though every thread is torn. Jeremiah envisioned such a dance of love.